DRAWING ENDED. See next Post for Spica winners. Thank you! I'm playing with some fabulous new Cosmo Cricket Honey Pie paper today, so how about an Easter card? I combined two PaperTrey sets here: the outside of a tag from Just Hatched, and the Cross and sentiment from Everyday Blessings. I used Versamagic chalk inks in Pixie Dust and Oasis Green, and stamped the tag in SU's Rose Red. 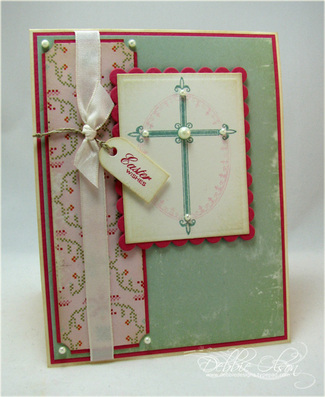 Pearls are Ivory, and cardstock is Prism Intense Pink and Natural. Ivory taffeta, hemp, and the ticket corner punch are from Stampin' Up. Note: I was using the Honey Pie 8" x 8" pad--just the right scale for cards. This collection reminds me of the Easter dresses that I wore as a little girl. . . If you haven't already seen it, Lisa Johnson posted a neat twist on the bag-a-lope concept, the treat-a-lope, yesterday. And now for a little treat: from my friends at Imagination International, Inc. (the Copic marker people), I have five sets of two Spica glitter pens each, a lavender and a melon (green) one. Here's the question of the day. Currently the Spica Glitter pens come in twelve colors plus clear. Most of them are mid-tones to dark tones: an evergreen, a bright green, gold, orange, red, lavender, royal blue, dark pink teal/sky blue, yellow, silver, and black. If colors were being added, what colors would you like to see added? That's it--that's all you need to answer in the comments section in order to enter. At 10:00pm CST on Sunday evening, I'll use the number generator at random.org to pick five winners. That should give those of you who get late Feedblitz notification time to enter too. Thanks for the feedback!